Known for her dreamy images that create perfect expressions of the soul, Nasreen Begum has a lot to say about Oriental Art: “Oriental Art has its roots in Mogul paintings and when the Mogul rule was replaced by British dominance, the control of this art was passed on to the different Indian states where the zamindars repalced the maharajas as the patrons of arts. Mogul painting was followed by Rajput painting which could be subdivided into Rajput, Basholi, Kangra, and Hyderbadi painting.” Nasreen adds that when British rule became rampant and the zamindari system was ruined, this art saw an ebb. During this time Abanindranath Thakur and his nephew Rabindranath Thakur felt that local Indian art should be revived and that one must replace the work of the artist with limited talent who were being promoted by the British. In 1948 in the Art College established by Zainul Abedin at Dhaka, the Oriental Art wash technique was continued. When Nasreen was admitted to the college in 1975, she had followed Chughtai's style taking images from cards and calendars. However, having graduated from Baroda's Maharaja Sayajirao's University, she developed a style of her own where she experimented outside the confines of the traditional dictates and grammar. She wanted to combine the western water-colour technique with the Oriental water colour dictates. “Now we try to finish the work at one go whereas earlier we applied numerous washes. The subject matter is definitely in keeping with contemporary life while I use the Oriental technique although even the latter has seen a change,” Nasreen added. 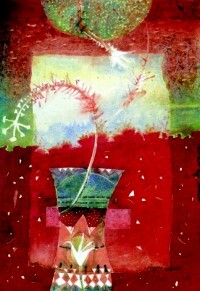 Red Hibiscus, water colour, 2004. 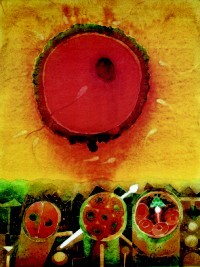 In Nasreen's exhibition at “Chitrak” she had continued with her “Door of a new life” series that had continued from 1992 - 95. The door had been a symbol of Nasreen's belief that new encounters must be overcome in one's progress in life. She had dealt with the “Leaves” and “Cacti” series. The difference between the earlier “Door” series and the present paintings was that the paintings are more abstract and the door now is presented as an open one, which is more decorative and contain washes of brighter and buoyant colours. The red in the painting stands for strength, while the Chinese ink used has been to bring in variation. The red too is used in gradations, verging from pink to maroon. “I'm gradually going in for minimisation. I feel this relates to my present life, which too has been simplified”. Thus circles, rectangles and triangles, found in the works like “The red door,' A'” have been used in a simple manner” represent hopeful expectations. The flowers, human figures and inclusion of the moon in another work also bring in a variation of the same bold but minimised colours. Another of her work presents a close-up of a single broken shell seen with the sea and the sand around it. Some of her works are obviously buoyant and confident with joyful colours and happy images reflecting a phase in Nasreen's life that is now peaceful and meaningful. She has struggled hard through the years to come to the stage of being the head of Oriental Art and rightly deserves the place, going by the successful exhibition with its numerous paintings, each piece a gem on its own. The fresh breath of motivation in each of her stages of a new phase of painting has been based on inspiration that she had acquired through the various workshops that she had attended. In her student years she had struggled, homesick for years at Maharaja Sayaji Rao University, Baroda, gathering what training she could under renowned artists. It was when she was back in her own homeland and sometimes overseas that the spark of inspiration came from the exchange of views and exposure to new styles and themes of other artists with whom she had the opportunity to exchange ideas. She says that there had been different phases in her work, as when she first studied at the Oriental Department at Dhaka, her work had been academic in the Oriental style. 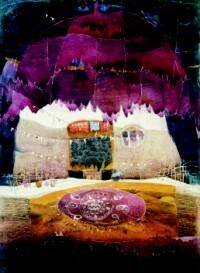 When she went to Baroda, she learnt print-making from 1980 to 1983. There, she had a cultural shock, as she felt lonely and friendless. Also, she didn't get all the guidance that she had dreamed of. She was surrounded by alien culture, where people spoke only Hindi, English and Gujrati. The depression and homesickness were naturally brought in the pensiveness portraits in dark colours which is something totally different from what you see today at the gallery. She has moved away from the cacti and melancholic, languid portraits which one saw even some years back, from symbols of women's drudgery and pain seen in the new doors of apprehension when women often get married in the east to the plant roots of steadfastness to the pulsating flowers and leaves and picturesque women's faces which speak of the happy coexistence of man and nature. There is also, obviously the reflection of Nasreen's present life, when she has at last, after ten years, a flat of her own to live and work in. Having struggled, Nasreen feels that she has at last grown to know herself and be at peace with the world after more than a decade of troubles and tribulations. In her consistent effort to do something new her work has changed radically from the past she has brought in the sea and sea shells, the falling leaves caught in the wind of time, the buntings the speak of joy and the dancing elements from nature around her like the iridescent red krishnachura petals and the soft translucent cacti blossoms. Nasreen has had five awards, five solos and has participated in over 17 national and international exhibitions. Nasreen, who has been drawing and painting since a child, feels that she is still learning, even though she is now an Assistant Professor at the Fine Arts Department, DU. For her painting is the beginning and end of existence. She was lucky, she says, to have teachers like Mahmudul Haque, Shahid Kabir, Kazi Gyas and the late Mahbubul Amin. From them she learnt water colour wash techniques in particular. Among the well-known artists of the west she is moved by Goya, Boticelli,Van Gogh, Picasso and Salvador Dali. Boticelli's female figures, in particular, influenced Nasreen's women's portraits in her Oriental Art creations. "More than my teachers and artists of the past it is the nature around that inspires me and eggs me on to work incessantly, filling my drawers with sheets of water colours. I take in the sky, wind, sunrise, moon beams, flowers, leaves, tendrils and pollen dust. 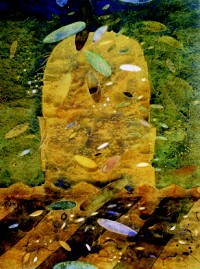 The change of seasons, specially before the rains,when the leaves are shed, also influences me. The months from Boishak to Srabon move me most in my paintings. The fallen flowers and leaves on the roads are elements that inspire me. The starry and cloudy skies and the full moons also inspire me. Elements like rivers and mountains also stir me up," Nasreen says. Dwelling on how she has kept to realism while others have moved on to abstraction and modern forms of different sorts, Nasreen elaborates, "Everyone has their own characteristic style. My personality is that of a neat, clean and disciplined individual. I love sunlit days full of colours and happy laughter. There are so many elements of nature I will not have finished capturing them all in a single span of life. That is why my work is clear and sharp but not necessarily realistic of late." Talking about whether she enjoys painting for herself or teaching art Nasreen says that she enjoys both. "I try to be sincere, honest and dedicated in everything that I do. I'm not quite satisfied with the teaching aspect of my life of late. As for the amount of time that I spend on painting, I try to paint as much as I can. The rest of the time I give to reading and teaching. I like reading essays on various subjects, specially creative ones." Asked if an artist's life is easier today or when she first started out as an artist, Nasreen says, "Bangladesh is a new country, having begun about fifty years ago. In this to survive as an artist is still difficult. As for Oriental Art, in which I concentrate, I feel that there will be appreciation for it as long as the artist is sincere. Art is like a flowing river that changes with time. And time will bring genuine appreciation for good work."